I don’t usually write here about the posts that I make on Demotix, preferring to wait until I have had time to take a longer look at the pictures I took and to sort out more of them for My London Diary. But it may be a little while before I get those from Saturdays events in London on-line here, while I spent most of Saturday night and Sunday writing stories and uploading images to Demotix. Saturday was a long day for me, and not without its problems. Everything started fine and I arrived at Camberwell Green in time to watch the final preparations of the ‘Armed Wing of the TUC‘ who then proceeded to march to Kennington with their Trojan Horse, tank, Spitfire, the 4 Horsemen of the Apocalypse, armed Lollipop Ladies and the large ‘Capitalism Isn’t Working’ banner. We walked to the South London Feeder March for the TUC demonstration (though for reasons best known to itself the TUC disowned all of the feeder marches) at Kennington Park, a location of some importance in the history of the labour movement, where there was a short rally before the couple of thousand or so there marched off to join the main march. I left them after a few hundred yards to take the tube from Kennington into Charing Cross and went to Trafalgar Square. I should have been there before the TUC march according to the published timetable, but they had started early and were already streaming past when I arrived. 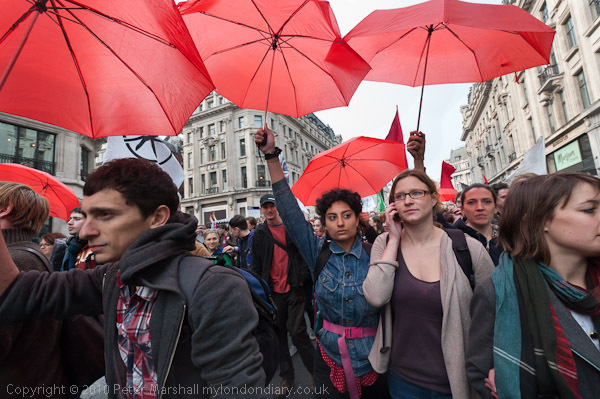 So I spent an hour or so taking pictures of the marchers and the other things happening around Trafalgar Square then – and also took some more pictures of the march which was still passing around four hours later when I was at Piccadilly Circus. 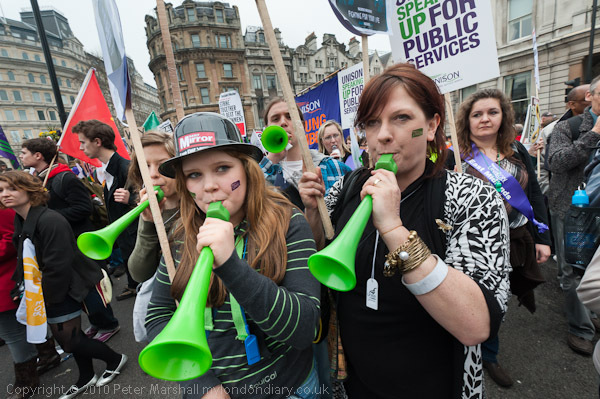 But both times included I probably saw fewer than a quarter of the approaching half a million on the march, so I called my Demotix feature Glimpses of the TUC March. Then I saw the black bloc of anarchists taking a different route and followed them for the next 45 minutes or so. They were not really doing a great deal most of the time I was with them, and the police seemed largely to be ignoring them. I read a newspaper report that they “broke through” a line of police at the bottom of Regent St, but most of them simply walked by on the pavement which the police were not blocking, and the police made little or no attempt to stop the few who kept on the road. A couple of police followed the group up into Regent St, and then down Conduit St. One anarchist account says they took this route as police were about to kettle them on Regent St, but there was really no sign of this happening, with just a few police in the distance. They let off a few fireworks and flares, and on Bond St a few made a rush towards a branch of the RBS, but the dozen or so police standing outside soon pushed them away. A few light sticks from placards were thrown and some paint sprayed, but little else. I kept taking pictures for a few minutes – although both cameras were splattered with paint, there was none on the lenses and they were still working fine. Most of the photographers around seemed to be taking pictures of me now, and I’ve seen one on Flickr that gives a good idea of what I looked like. before retiring to a nearby public convenience and wiping and washing off as much paint as I could. 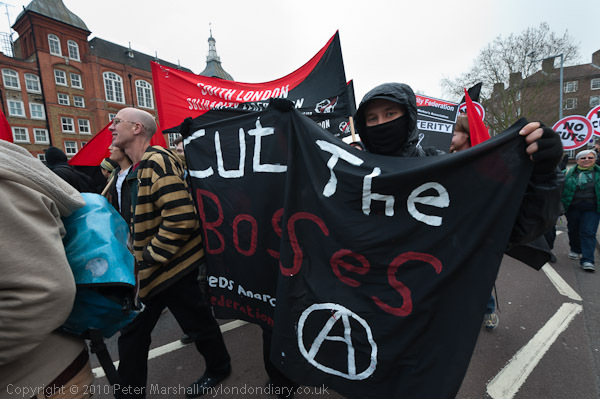 You can see my pictures of the black bloc in Anarchists March on Oxford St, although events with them did get a little more interesting after I had left them. Though I’m not sure why so much media attention is directed towards this very small group – really just a few hundred – and their activities. Though I would like it if the BBC and others actually took the trouble to find out who was who and what things were about, having just watched a video in which the BBC presenter refers to them as anarchists, Socialist Workers Party and UK Uncut. Or is it a deliberate policy to misunderstand and mislead? A ball of emulsion goes a very long way, and although I wiped as much as I could off my jacket, the surface of my jumper, both cameras and elsewhere I gave up with a great deal of paint still on me, and feeling rather uncomfortable with a a slab of wet paint in my vest, shirt and jumper soaking my chest. I spent the next hour or so with the very different UK Uncut who were holding peaceful protests, an outdoor comedy show and a party in and around Oxford St. Being covered in yellow paint is quite a good ice-breaker, but I hope to avoid it in future. 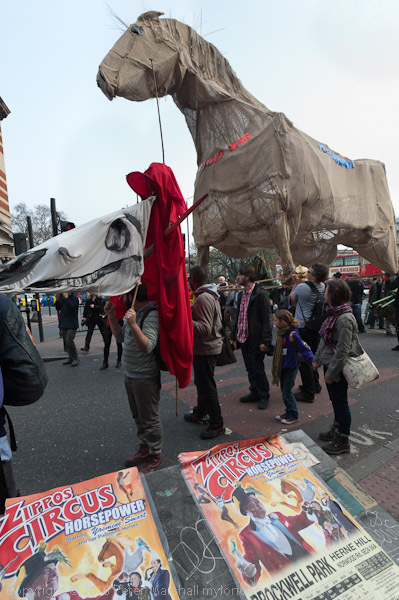 There are a few pictures and some text at UK Uncut Party and Protest on Oxford St. The I left with one of the groups that was making its way to a protest at an undisclosed location (following the red umbrellas) which turned out to be Fortnum & Mason’s, although I didn’t get there. At Piccadilly Circus I was feeling a bit fed up and decided it was time to go home and clean up, though I did hang around for a bit and take pictures of the TUC marchers still passing by. 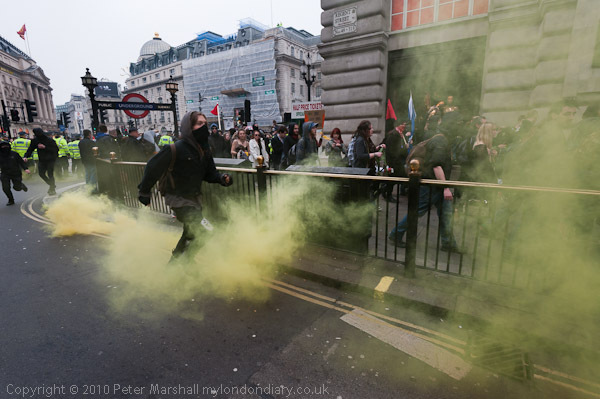 Despite some of the stories in the press and broadcast on radio and TV, the UK Uncut action at Fortnum & Mason remained non-violent and the protesters were very careful to avoid any damage inside the store. Outside was apparently a different story, with other protesters having what several people have described as a riot, with some injuries to both protesters and police. But when, by arrangement with the police, the UK Uncut protesters filed quietly out of the store, they were all photographed, handcuffed and arrested, and most at least were held in custody for around 24 hours before being released. This is a piece that has clearly hit a number of nerves among those who weren’t there and show little or no understanding of what is actually happening on the streets of Britain today, but although I may not always like her style, most of what she writes rings true. I was I suppose lucky that I was only hit by paint. One of my colleagues was hit by a brick, needing nine stitches – and was lucky that it just missed his eye – and another had his camera smashed. I’m not sure I’ll ever get all the paint off of my gear, but it still seems to be working fine. Given that they were already pretty worn it isn’t a great problem. I did have some anxious hours when the D700 stopped working after I’d been scrubbing it a bit too much and some water had penetrated, but it recovered after I’d dried it for a few hourse3 in front of my computer fan. Most of the clothes I was wearing are ruined, although I’ll perhaps keep the paint stained jacket and trousers for covering protests where similar things might occur. This entry was posted on Monday, March 28th, 2011 at 04:59 pm and is filed under My Own Work, Photo Issues, Photographers, Political Issues. You can follow any responses to this entry through the RSS 2.0 feed. You can leave a response, or trackback from your own site.